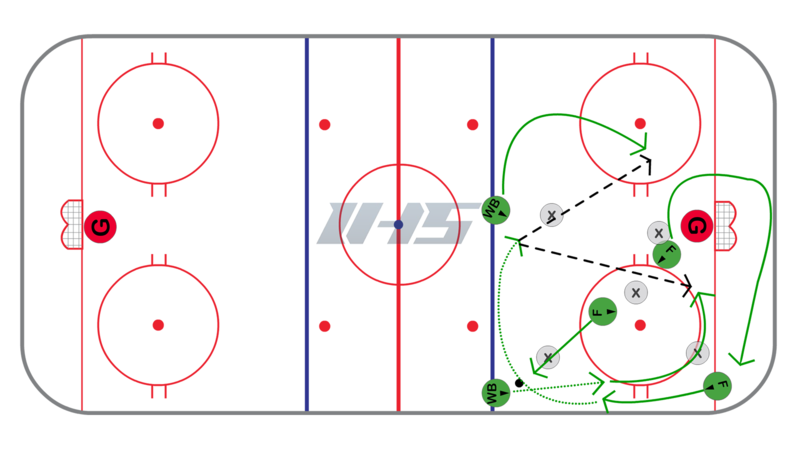 Offensive Zone - Net Front Cycle #2 | Ice Hockey Systems Inc. This net front cycle just shows another option. This time the puck carrier will carry the puck off the wall and high into the slot. The high forward will take their place at the point. The other offensive defensemen will sneak down below the opponent that should be covering them. If that opponent is staring at the puck then they can usually sneak behind them undetected. They will typically have several options. They can pass back to the player that just passed them the puck in the high slot, shoot, or pass to the back door to the player that is coming off the wall to the net.